This recipe has us dreaming of summer! Garlic Scape Sauerkraut is super easy to make and also is a great topping on almost anything! 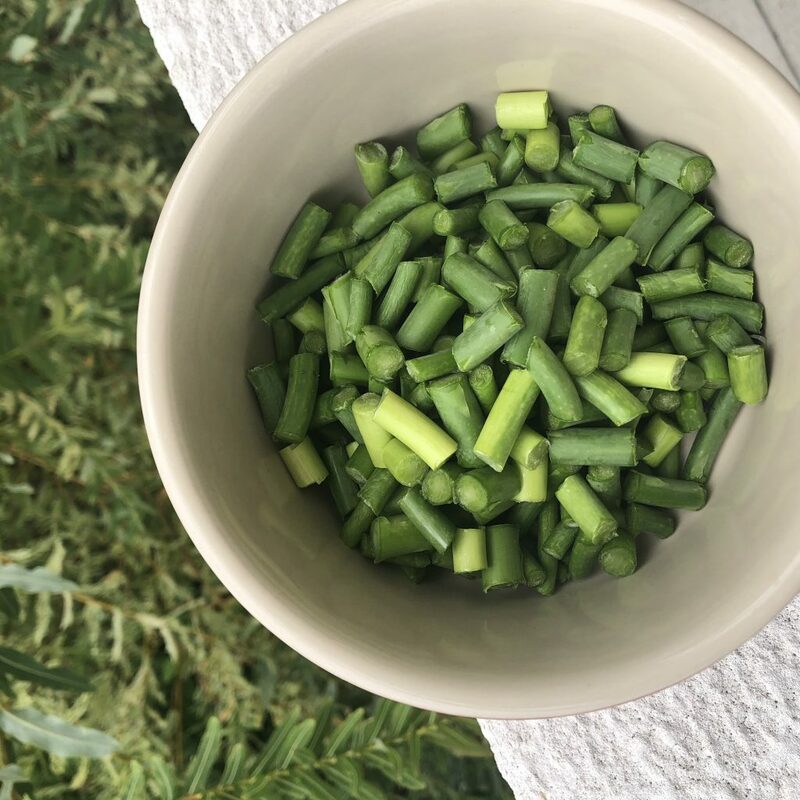 Every summer there is a couple week period when our farmers’ market is full of garlic scapes. We put them on or in literally everything. This past summer we hit the sauerkraut jackpot by receiving garlic scapes and purple cabbage in the same CSA box. 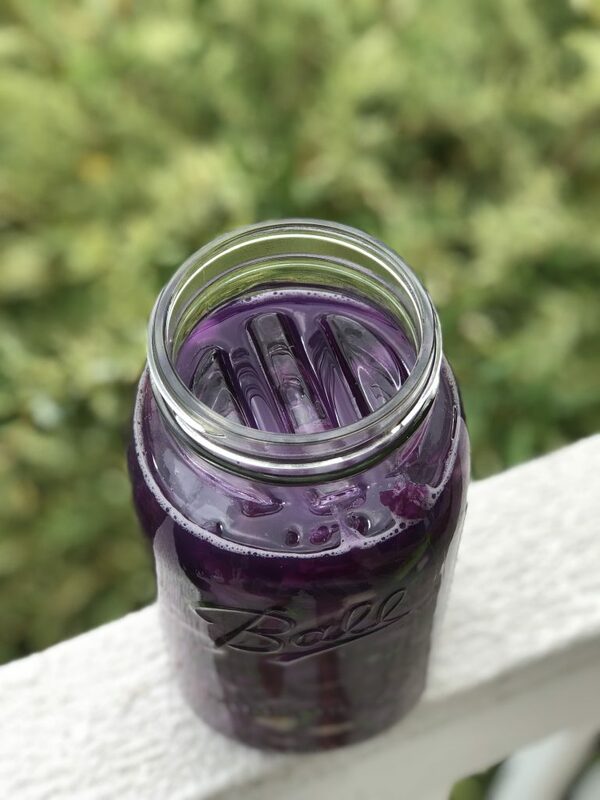 While we generally prefer napa cabbage for sauerkraut, we thought this purple cabbage would be to fun try. And it turned out fantastic! 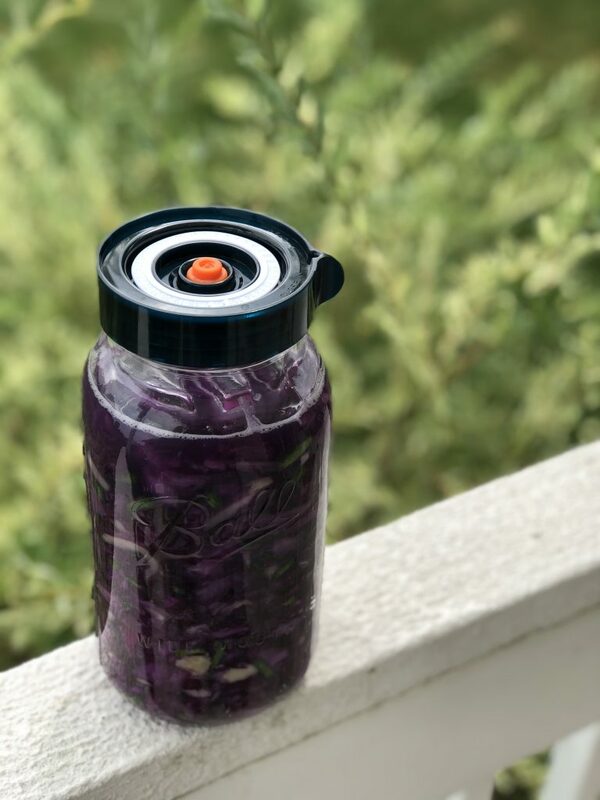 The purple sauerkraut stays nice and crunchy and it has an amazing garlic flavor. First, prep the cabbage by removing the outer leaves and core. Set these aside for later. Then shred the cabbage or cut very thinly. We sometimes use a food processor for this, although a good knife will do the trick too. You could also use a cabbage shredder if you have access to one. Place half of the cabbage in a large bowl or pot and add half of the salt. Massage the cabbage until it begins to sweat. Add the remaining cabbage and salt and then repeat the massaging process. If you’ve never massaged cabbage, basically think of it as grabbing with the hand and squeezing (like a sponge) and repeating over and over. This will squeeze the water out of the cabbage. You’ll know your cabbage is ready when it’s dripping wet and there is a small amount of liquid in the bottom of your bowl. Next, chop the garlic scapes and mix into your cabbage. We prefer to keep them to bite sizes pieces but you could certainly chop them finer. Now you are ready to pack your jar. Take your glass jar and add a layer of the cabbage and garlic scape mixture. Pack down with a wood spoon or cabbage pounder. Repeat the process over and over again until your jar is nearly full. Always being mindful that you are really packing down your mixture each time. You’d be surprised just how much you can fit in a half-gallon jar. 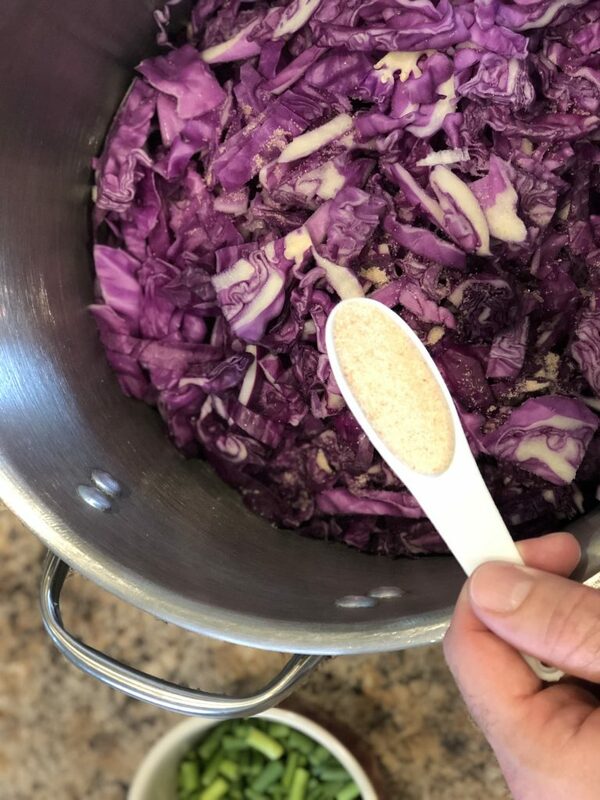 Fill almost to the top but leave a little room for your “weights.” It’s important to keep everything you want fermented submerged in brine because the microbes convert sugars into lactic acid which inhibits the growth of harmful bacteria. It’s easy to do this with cabbage – simply place some of the outer leaves on top and fill in the rest of the space with pieces of the core (these are your “weights”) you set aside earlier. Or you can purchase glass fermenting weights which fit perfectly in your jar. The other option is to use an airlock type lid. An airlock allows for gas to escape without letting any oxygen in. This lets you ferment in a completely anaerobic environment. For this recipe we used an Easy Fermenter lid. This lid works as an airlock so we can simply “set it and forget it.” I’d recommend them if you’re sick of burping and smelling your sauerkraut. They can be used for many other types of ferments too! We let this batch ferment for about four weeks. 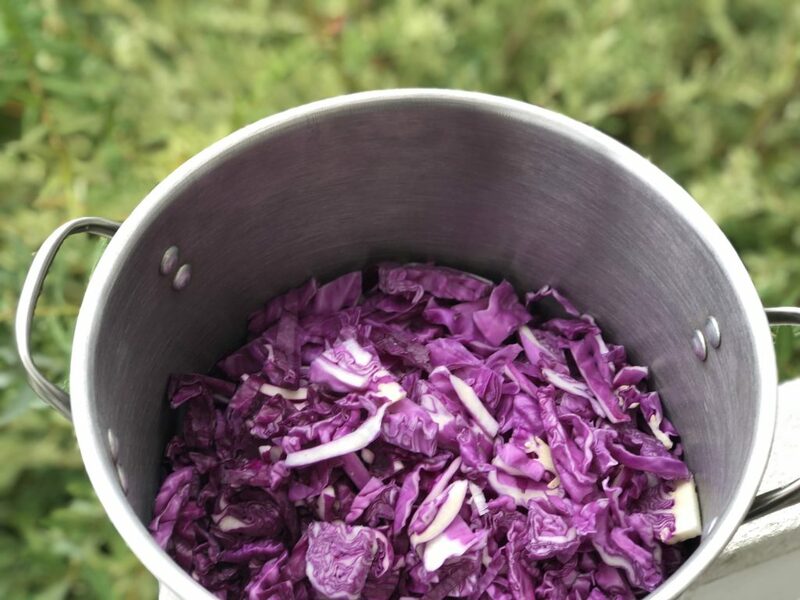 We recommend letting it ferment for the same amount of time you generally ferment any sauerkraut for. Then shred the cabbage or cut very thinly. We sometimes use a food processor for this though a good knife will do the trick too. You could also use a cabbage shredder if you have access to one. Next, chop the garlic scapes and mix into your cabbage. Now you are ready to pack your jar. Take your glass jar and add a layer of the cabbage and garlic scape mixture. Pack down with a wood spoon or cabbage pounder. Repeat the process over and over again until your jar is nearly full. Simply place some of the outer leaves on top and fill in the rest of the space with pieces of the core (these are your “weights”). Or you can use glass fermenting weights. 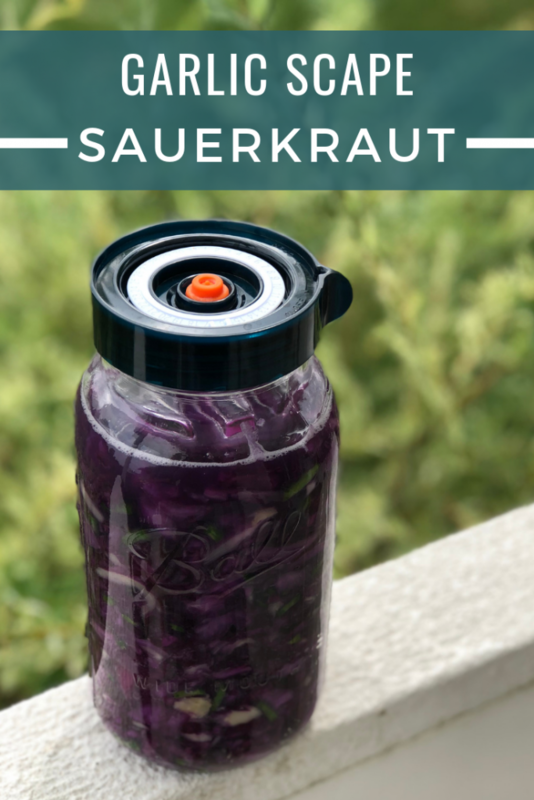 When it comes to putting a lid on your sauerkraut, you can simply use the lid that came with the jar. If you decide to go this route, you’ll need to put your jar on plate and burp it every day for the first 3-5 days. If not, you’ll risk the liquid overflowing out of the jar and making a smelly mess. The other option is to use an airlock type lid. An airlock allows for gas to escape without letting any oxygen in. This lets you ferment in a completely anaerobic environment. Let ferment at room temperature for about 4 weeks.